This hoya comes from Indonesia and it was described in 1837. The species name verticillata means whorled. It probably refers to the flower clusters which might be whorled. 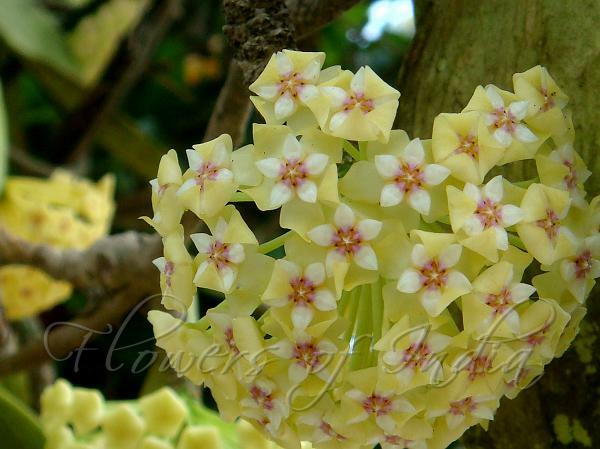 There are many variations on this hoya and different colors in the flowers and quite a wide variation in the leaves. 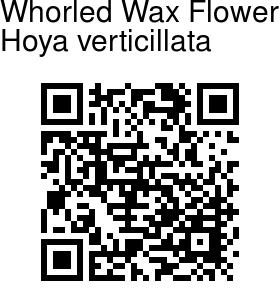 It is a climbing hoya with leaves about 6-11 cm long and 2.5-6 cm wide. The leaves are quite thick and hard, light green to dark green with lighter nerves and some spots. This hoya can flower quite early, sometimes by cutting already! Flowers are folded back, about 1-1.5 cm. The flowers have yellow/green corolla that gets paler under the corona, which is white with a pink circle in the middle. Flower has usually a fairly spicy aroma, lasts about 5 days. Some varieties produce much nectar, and some almost none at all.